I find Relief Synergy especially beneficial in treating tendinitis and lumbago. I will recommend it to my patients. How Can Remedy Box - Relief Synergy Help? Relief Synergy is a multipurpose formulation of ten 100% pure essential oils known to have analgesic, muscle relaxant and tension relieving properties. Relief Synergy can be friction rubbed undiluted onto the affected area. Relief Synergy is non greasy with no added alcohol, base oil or chemicals. 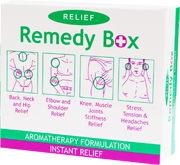 Relief Synergy REMEDY BOX contains 10 single dose treatment sachets. Tear sachet and use the oil as a rub for immediate relief from: Neck & Back Pain, Muscle Pain, Joints Pain, Arthritis Pain, Elbow Pain, Hip, Knees & Ankle Pain, Sprains & Strain. RELIEF Synergy is a natural alternative providing safe and efficient way to relieve pain quickly. Used by Medical Doctors, Medical Clinics, Acupuncturists Massage Therapists and in Hospital Physiotherapy Departments & Used by Athletes. In today's hectic and stressful lifestyle, we all need that extra help to feel rejuvenated. Whether one is running a business or a household the stress takes its toll physically and mentally. Recent surveys have shown that more and more people are suffering from back, neck and joint pain or headaches, due to stress or other physical strains, leading to widespread use of painkilling tablets. Although most people know that taking painkillers is not healthy, who can blame them as in time of pain they want quick relief. Until now there has been no natural alternative. "Relief Synergy" is a formulation of essential oils which have therapeutic properties (listed in Int. Pharmacopoeia) of being anti-inflammatory, analgesic, muscle relaxant and circulation stimulant. Few drops are rubbed onto the problem area and within few minutes the molecules of the oil release their properties. As the blood capillaries come in contact, the molecules of the oil are carried away in the blood where the bio-chemical re-action of the therapeutic properties takes place. In most cases the effects of Relief can last up to 24 hours but in acute cases it can be from 2-6 hours. This depends on the release of essential oil components from epidermis into the dermis, depending on the physical strain. Tear sachet and use the oil as a rub for immediate relief. Heres Health :: What a Relief ! Mens Health Magazine :: Blitz Headaches Vintage Times ::Instant and lasting Relief from your aches and pains - naturally ! Relief Synergy helps to enhance the efficacy of treatment in difficult cases especially treating rugby related injuries. Feel 10 years younger and smells wonderful! I am writing to thank you for introducing me to Relief Synergy during the treatment of nmy back. Although the pain and stiffness have gone, I still use Relief Synergy - it makes me feel 10 years younger and smells wonderful. Relief Synergy helps to enhance the efficacy of the treatment in difficult cases especially treating the Rugby related injuries.